Here´s an easy way to tie proper parachute flies allowing you to tie any kind of parachute without problems. 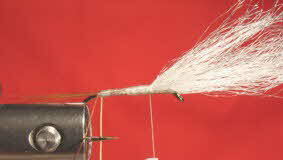 One of the most evident problems is usually making a proper whip finish without tying down your hackle fibers. My easy solution allows you to finish your fly within seconds without problems at no extra cost for special tools or the like. 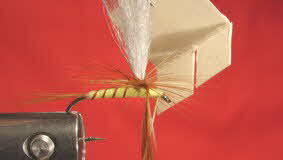 Here you will find a fly tying instruction for the parachute flies by Wolfgang Fabisch. 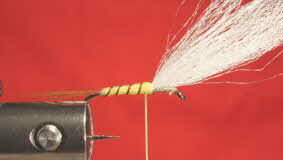 The 1st and 2nd photographs show the first steps which are exactly the same as for most dry flies. You wrap on your tying thread and add touching turns until your wraps reach just a little farther than the middle of your hook shank. Next you tie in your wing material. Cut this at an angle towards the back so it forms a nice taper. Now wrap your thread towards the bend, slightly farther than the hook´s point, as seen on photograph #2. 3) Now tie in your tails, ribbing material and body thread. 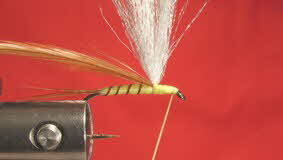 When tying in the tail, be careful not to pull it sideways or down! 4) Form the body with your body thread and then rib it, Tie down your ribbing material just behind the wing and cut off the surplus. 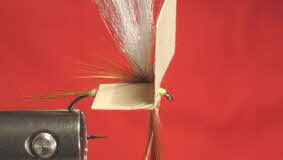 5) Use your body thread to raise the wing post to an upright position, i.e. wrap a few turns from the front towards the wing post while holding the wing in an upright position. 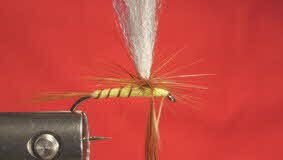 Once the wing stands straight, tie in your hackle so it points backward at an angle of around 45°. Now make a knot (half hitch or whip finish). 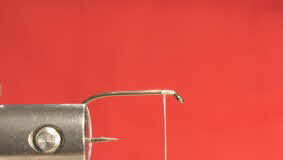 6) Take your hook out of the vise and re-clamp it with the eye facing down. That´s why we made a knot in the first place. 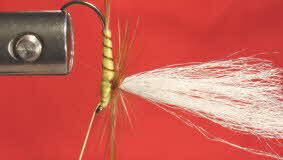 7) Now wind your hackle around the wing post. You start near the hook shank and wind it up the post 4 to 6 turns. 8 - 10) Bring your hook back into normal position. 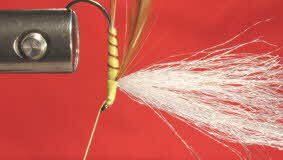 This is when the problem of tying down your hackle without also tying down some hackle fibers arises. A thin piece of cardboard will help us with this. Cut a square piece about 1 by 1 cm. Fold one side at about 0.3 cm at an angle of approximately 90° and cut a small slit as shown on the photograph. Now push the cardboard over the wing post all the way. 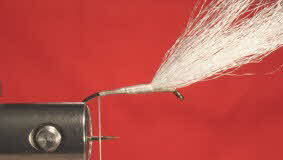 The excess hackle is hanging down from the slit. This way the hook eye and and the front end of your fly become well accessible and you may tie off your hackle and apply your whip finish without a problem. The first time I described this little tool was in "Fliegenfischen"- Magazine, issue 3/1989. It has been surprising ever since how few parachutes are still to be found in the average fly-box. 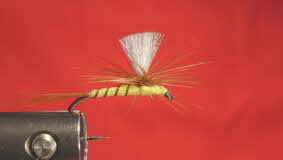 A parachute - fly imitates naturals much better than a fly with a standard hackle wound around the hook-shank. Try it, you´ll love it!